Applications:Photo quality brochures, proofs, photo printing, flyers, etc. Our 32lb. Premium Photo Gloss is a cast coated inkjet gloss paper. Cast coated paper is inkjet glossy stock that feels like a sheet of good quality paper rather than a photo. One side is glossy, the other side is a plain matte paper on the back. While we refer to this stock as an inkjet stock it also yields exceptional printing results when printed on laser printers. This 32lb sheet is very popular, it is a light-weight, bright white sheet featuring a mirror smooth reflective printing surface. This stock is also available in 8.5 x 14 legal size sheets. 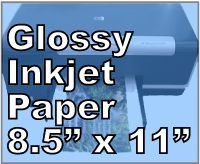 This paper is quick drying, non-smearing, and gives high quality reproduction of detail on high resolution printers. Great for photo printing, brochures, covers, proofing, graphic design, flyers, catalogs, and many other office and business applications that require high quality images. Good for use with all HP, Kodak and Lexmark inkjet printers, as well as Epson Photo (dye ink). Use with all inks except pigment (some Epson and Canon printers use pigment inks).